My recent trip to Bend in central Oregon proved to be a bit more interesting than I initially expected. While I was there, the Two Bulls forest fire erupted just outside of the City. 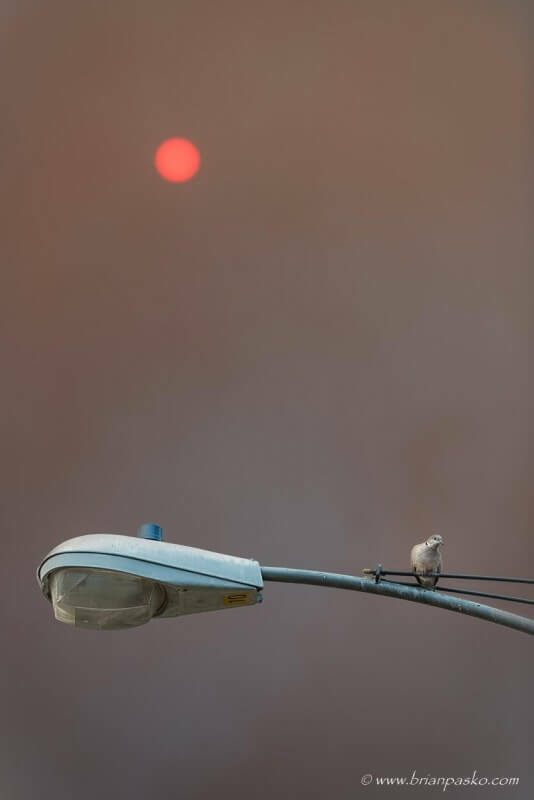 The sky became thick with smoke, turning the sun blood red and casting an eerie light across the City. But, as we all looked up, this small,solitary dove found its own amusement by gazing down. (You can click on the images to see larger versions). As I left Bend, I made my way to the top of Pilot Butte, just before it was closed for safety reasons (apparently everyone else in Bend had my same idea and was visitng the Butte at the same time). I had the good fortune of being the last person allowed to enter and leave the Park, and created this panorama of the fire burning outside the City just as the setting sun hit the horizon. As I am accustomed, I drove back to Boring, Oregon late that evening. 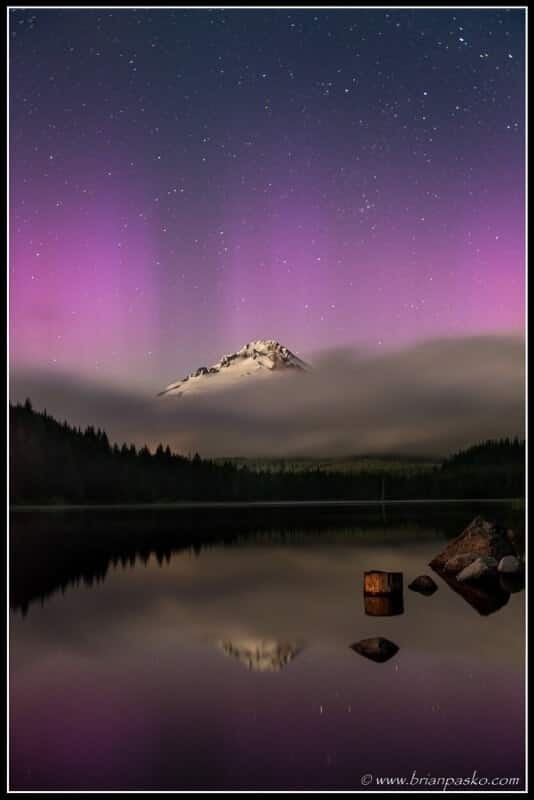 After a long day, I traversed the pass near Government Camp around 2am and decided to make a short stop at Trillium Lake on Mount Hood to see what I could see. There, Mount Hood seemed to welcome me home with this beautiful show of light. 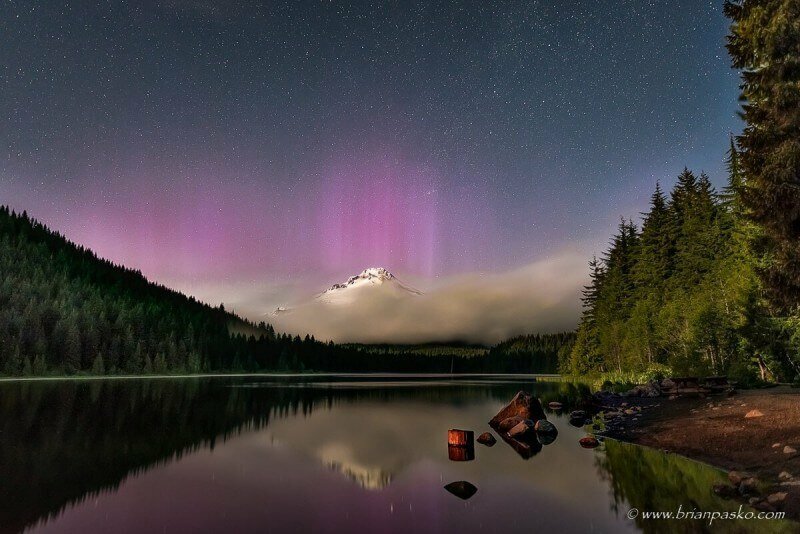 The moonlit mountain, a neighbor’s campfire, and appearance of the aurora borealis (northern lights) all combined to make an interesting illumination of the scene in these photographs!